Is there any group tour that can be shared with other people? We basically offer only private tours, not group tours. Is it possible to plan for one person? Yes, it can be done. However, additional charges may apply. Please contact us for more details. Do you offer a car-only plan? One of my family members requires artificial dialysis. Can you recommend a hospital? We will also do our best to arrange a medical interpreter for such circumstances, however please understand this may not be possible in some cases. I know that not many restaurants in Japan offer vegetarian or vegan meals, but can you respond to this kind of food limitation? As a local company, we are proud to say that we are capable of finding many restaurants across Nara that can easily respond to even complex requests. Please fully enjoy the blessings Nara has to offer! Can you plan a tour that is friendly to wheelchair users as well? We receive many customers who participate in tours in three generations, so we deal with this kind of requests on a daily basis. Please contact our team for more details. What happens if I suffer unexpected accidents or injuries? We will do everything within our power to make your travel go perfectly and safely but in case of unexpected accidents or injuries please contact the concierge in charge as soon as possible. We will make sure to support you to get through the unfortunate circumstances wherever we can. We strongly recommend you arrange an appropriate travel insurance before you start your journey with us as having travel insurance can help protect you from a variety of unexpected circumstances while you’re traveling. Can I make my payment in cash? We only accept credit cards or bank deposits as a payment method. 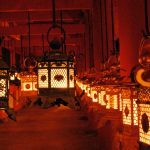 As we offer a complete package tour, we do not reveal the details of our fees. Why is the fee for children almost the same as that for adults? It’s because some hotels and lodging facilities have no discount price set for children. Also, a car hire fee will be the same, regardless if there is any children included or not. Why isn’t lunch and some of the dinners included? As we consider meals one of the most important elements for your trip, when there is less than 10 customers, we offer the most suitable option according to your requests after the tour has been confirmed. Can I use credit cards to shop in Nara? Although credit cards are becoming much more widely accepted, especially in urban areas and places popular with tourists, cash remains king. When booking accommodation, particularly in more rural areas, check payment options and ensure you have enough cash with you to cover your stay in case payment by card is not an option. Note that ATMs can be few and far between outside of Nara City. Can we see cherry blossom anywhere in Nara? Renowned for having some of the country’s most spectacular cherry blossom, Nara has always been a popular destination with the Japanese in spring. But it’s not all cherry blossom: from late February through into early July, the parks, gardens and temple grounds see peonies, hydrangea, rhododendron and other seasonal flowers bloom in a profusion of colors. How can we travel to Nara from Kansai Int’l Airport? 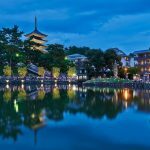 Located close to the major transport hubs of Kyoto and Osaka and with easy access to shinkansen lines, getting to Nara from Japan’s major cities is fast and uncomplicated. Domestic flights are available to Kansai Int’l Airport 90 minutes away and express bus routes also serve Nara. Nara’s rail network is operated by the Kintetsu Railway and West Japan Railway (JR West). As such, Nara has two train stations: Nara Station on the JR Line and Kintetsu-Nara Station on the Kintetsu Line. While rail is a quick and convenient way to travel to Nara, express buses offer a more affordable alternative and connect Nara with Nagoya and the Shinjuku area of Tokyo. Limousine buses, essentially airport shuttles, operating from Kansai Int’l Airport and Osaka Airport relieve some of the stresses of travelling with luggage, dropping passengers off in Nara City. Make sure to carry your passport with you when shopping. International visitors spending less than six months in Japan are eligible for tax exemption on general items and consumable goods at participating stores. Look out for shops displaying the “Japan. Tax-free shop” symbol. To qualify for tax-free shopping, the value of purchases made within one day at a single store (excluding consumption tax) must exceed ¥10,001 for general items, and more than ¥5,001 for consumables. 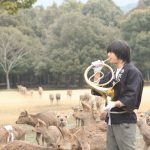 What is a tipping culture like in Nara? It is uncommon to tip for services here in Japan, so it is not essential, but if you feel satisfied after the trip, tipping to our driver or guide will be greatly appreciated. What is the autumn like in Nara? In autumn the weather cools off making hiking a more comfortable experience. From mountains chosen among the country’s top one hundred to World Heritage pilgrimage trails, there is no shortage of hiking options. As with spring, autumn is also known for its views: rice fields take on a golden color and the leaves of trees, especially in Nara Park and the grounds of shrines and temples, appear ablaze in reds and yellows. Sake, rice, persimmons and many other foods are at their best in this season. What is the climate in Nara? Nara Prefecture enjoys a temperate climate with winter temperatures rarely dropping below freezing. Summer is usually hot and can be quite humid, with heavy rain falling at times. The most comfortable temperatures are seen in spring and autumn averaging approximately 15 to 20 °C (59 to 68 °F). If travelling to more mountainous areas, especially in the south, expect temperatures to be a few degrees cooler than Nara City and other flatland areas. What type of public transportations are available in Nara? Served by the Kintetsu Railway and West Japan Railway (JR West), most of Nara’s regions can be accessed with ease by train. An extensive bus network operated by Nara Kotsu is also in place for access to more rural areas, and as an alternative to rail travel. Nara Kotsu operates the prefecture’s extensive bus network, making it possible to travel to many of the more remote areas not served by rail. 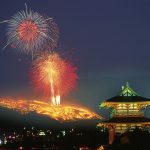 They also run many tourist-friendly bus routes linking the key attractions in Nara City, and in other popular areas like Asuka. Where can I withdraw cash in Nara? To withdraw cash on an internationally issued card, use one of the convenience store ATMs at either 7-11, Family　Mart or Lawson. Japan Post ATMs, located at most post offices, can also be used. ATMs at many banks and other convenience stores tend to be for domestic use only. For currency exchange, head to Nara Visitor Centre & Inn or one of the banks in Nara City. It is worth noting that Japanese banks are only open between 09:00 and 15:00 on weekdays.